Rangers boss Walter Smith has encouraged officials and the SFA to directly speak out against those who are "questioning their integrity". 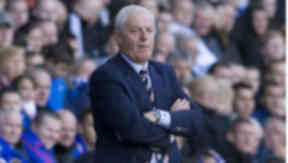 Walter Smith has called on Scotland’s on strike referees to speak out and name the clubs they claim are questioning their integrity. The Rangers boss, speaking ahead of his team’s scheduled game with Dundee United on Sunday, also believes the refereeing fiasco is damaging the reputation of Scottish football. Smith though refused to blame referees for the current state of play, saying the responsibility to bring an end to strike action lay with the Scottish Football Association. “I don’t think anyone at my club, certainly I haven’t, has questioned the integrity of a referee,” said Smith. “If they have got a problem with people that they feel are questioning the integrity of a referee, they should name those people, rather than making it a criticism on a broad basis. “Referees are out there and they have to make a decision. Sometimes we disagree with that decision. We go in 10-15 minutes after a game and express our disappointment and we get their opinion. “But I would never question their integrity as to why they have made a decision. I don’t think that there’s any need for them to write a letter to every club asking them to state that they will not question integrity. “For a period of time, there has been an undercurrent of too much criticism towards referees. Obviously they themselves feel it is time to bring it into focus for everyone. “I don’t think we can blame the referees for doing that as they have been under a fair bit of pressure, especially this season. But last season as well we had a period where that happened. “We are disappointed this is the way it has turned out. But I can sympathise with their reasons for doing so.